TASK presents ICF Autumn Collection 2017, the latest range of ICF products with a refreshing design and a high-end functionality. The well-established Italian company are renowned for the design and manufacture of products distinguished by their harmonious forms, quality, ergonomics and style. ICF is exclusively distributed by TASK in the UK. Please click here to view the ICF Autumn Collection Brochure in PDF. A simple and elegant chair, defined by an essential curved steel structure, which is extremely solid and especially lightweight. Every detail of the NoTable speaks of hidden sophistication behind apparent simplicity. Die-cast aluminium legs stem dynamically from the floor to give the table its remarkable lightness. 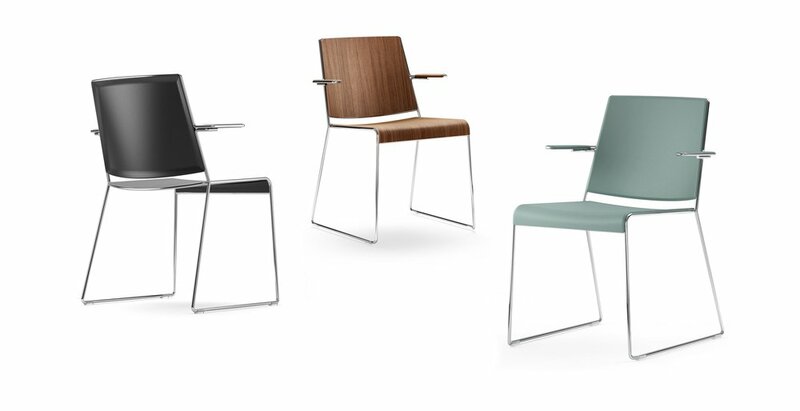 Even more versatile, to offer even more: the new Una Plus maintains everything that is needed to guarantee a seat with perfect ergonomics, free from complex technical details. Solid and long-lasting, Bevel range combines aesthetic beauty with balanced forms. Aesthetically comfortable: two words that masterly summarise the basic concept of Valea, an office armchair that stands out for its classical aesthetics and unique comfort. Unitable is a system open to continuous transformations because it's based on a structural element - namely, a beam in extruded aluminium - that can be used individually or combined with other transverse beams, and also acts as a housing for cables. Please Email Us to request priced ICF Specification Guide.